Wheelersburg picked up an 8-0 win over South Webster Monday, their second straight SOC II win. It nearly took a full second game to determine the winner, but Matthew Risner’s bases loaded walk off single in the bottom of the 13th helped push Minford past Waverly 4-3. Elijah Vogelsong and Ethan Lauder led the Falcons at the plate Monday by going 2/6 and 3/6 respectively. Vogelsong tacked on two RBI in Minford’s win as well. Lauder pitched over a full game Monday going for 8.1 innings allowing just four runs and zero earned runs. Bailey Rowe allowed just two hits and struck out five Waverly batters in 4.1 innings of relief in Monday’s win. Northwest’s scoreboard lit up Monday night in SOC II action as West defeated the Mohawks 16-10. Trevor Staggs had a huge day for the Senators by going 4/5 with a game high five RBI. Cade Powell also knocked in two RBI in the Senators and Mohawks high scoring affair. Kayden Zumbro led the Mohawks at the plate by finishing 2/3 with three RBI. Wheelersburg picked up their second straight SOC II win with an 8-0 win over South Webster. Wheelersburg will play in a tournament being held at Greenup County beginning Wednesday. In a full seven inning affair, Valley sophomore Breckon Williams and senior Tanner Cunningham combined to throw a no hitter in a 5-1 win over Oak Hill. Williams pitched three innings giving up a run and walking five batters while Cunningham pitched four innings of relief and walked just a single Oaks batter. At the plate, Jared Morrow picked up the Indians lone RBI in the win while going 1/1 with two walks drawn. Clay defeated Eastern Monday night at home 11-0 in five innings. Panthers sophomore Clay Cottle led Clay Cottle led the Panthers at the plate by going 1/3 with three RBI and two runs scored. Evan Woods, Reece Whitley, Dakota Dodds, Bradley McCleese, and Shaden Malone each picked up an RBI in the win. McCleese finished 3/3 with a walk while Whitley finished 2/4. From the mound, Dodds excelled as he has over the course of the season. Dodds struck out seven batters while allowing just five hits and zero earned runs. 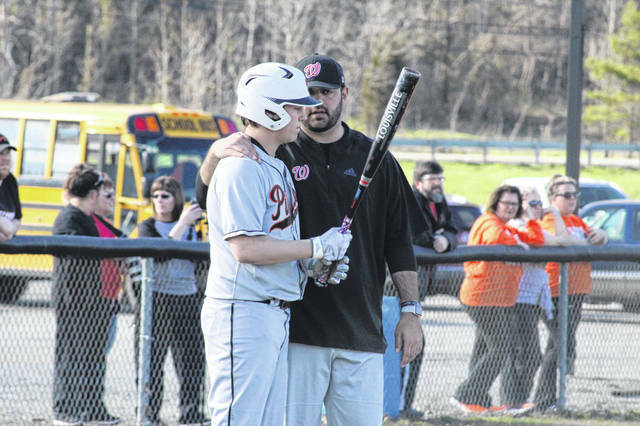 Wheelersburg took care of business Monday, defeating SOC II foe South Webster 12-0. Senior Sarah Claxon took the mound for the Pirates and did not disappoint. The senior ace pitched all five innings of Wheelersburg’s win allowing just one hit and not walking a single batter. Claxon also helped herself at the plate by going 2/3 with a team high three RBI in the win. Christen Risner finished Monday’s game 1/4, her lone hit being a two-run home run in the top of the second inning. Rylie Hughes went a perfect 2/2 at the plate with two RBI while Addi Collins finished 1/3 with two RBI. In a home SOC II battle, the Northwest Mohawks picked up their first SOC II win of the season with a 9-0 decision over the West Senators Monday night. On the mound, Lexi Throckmorton and her Mohawks defense mowed through the Senators lineup. Throckmorton allowed just two hits and two walks while striking out five batters in her complete game win. At the plate, Haley Hawes, Addi Newman, and Jaiclyn Burchett each drove in two runs in Northwest’s win. Senior captain Laiken Rice also drove in a run in Northwest’s win. Portsmouth earned a home OVC win Monday night over Rock Hill, 9-0. Kylee Montgomery got the start on the mound for the Trojans, and she excelled. Montgomery allowed just seven hits, one walk, and four strikeouts in her seven innings of work. Portsmouth didn’t hit just one or two home runs in Monday’s win, but three balls cleared the fence for the Trojans in their OVC win over the Redwomen of Rock Hill, one each from by Maddison Perry, Cassidy Potts, and Olivia Ramey. Perry drove in three runs in the win while Potts and Ramey each drove in two runs apiece. Notre Dame continued their perfect start to 2019 with an 11-0 win in five innings over SOC I foe New Boston. Junior Cassie Schaefer can do a lot of things in the softball diamond, and she showcased that Monday. From the mound, Schaefer allowed just three hits while striking out eleven Tigers batters. At the plate, Schaefer powered out a solo shot in the bottom of the first inning. Sophomore Claire Dettwiller followed in Schaefer’s footsteps in the first by powering out a home run in the first inning. Dettwiller finished with three RBI in the win. Isabel Cassidy finished 2/3 at the plate with three RBI while teammate Paetyn Collins finished 1/3 with two RBI. Clay picked up a 12-0 win over Eastern Monday in five innings. Preslee Lutz got the start on the mound for Clay in the win striking out fourteen of seventeen batters faced. Lila Brown and Shaelyn Vassar each drove in two runs for the Panthers in their 12-0 win going a combined 3/3.